The recent initiative of the Delta State Governor, Dr Ifeanyi Okowa, in requesting the company of immediate past President Goodluck Jonathan for a joint visit to Gbaramatu kingdom in the oil producing area of Niger Delta in pursuit of peace, is clear demonstration that a new wave of patriotic support has emerged to boost the on-going efforts of the President Buhari’s leadership to restore peace in the Niger Delta region. Governor Ifeanyi Okowa’s role as a new dove in the Niger Delta crisis despite his contrasting partisan interest with the Nigeria’s ruling government of President Buhari is not only highly commendable but demonstrates unique intent for collective pursuit of peace. Nevertheless, this Okowa’s presumed desire for peace demands a thorough substantive discussion that should not end with mere rhetoric. For now, it is wise to recognise that the fresh initiative for calm by Governor Okowa may be the much needed rational response to the Niger Delta uncertainty. 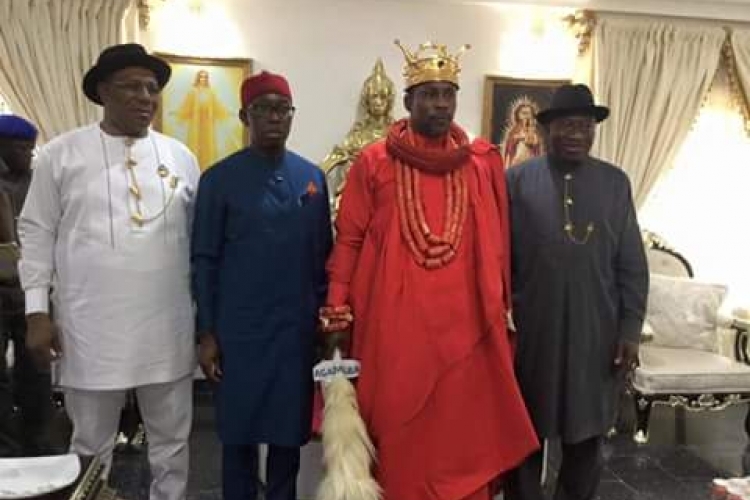 In truth, Governor Okowa’s idea of taking former President Goodluck Jonathan to appeal to the King of Gbaramatu for peace in the Niger Delta region is considered an effective and purposeful diplomacy. Indeed, it is an indication that peace in the Niger Delta may no longer be a distant prospect because this particular action shares a number of features with the past strategy employed in restoring peace in the Niger Delta by the late President Umaru Yar’Adua. Without a doubt, the problems of militancy in the Niger Delta region of Nigeria’s oil producing areas have had real bite in reducing the Federal Government’s revenue particularly in its era of economic recession. Presently, under President Muhammadu Buhari’s leadership, where both oil production and price have sharply reduced, what this simply portends is likely threat of economic turmoil for a nation with inadequate foreign reserves, yet highly dependent on troubled proceeds from oil sales which accounts for over eighty percent of its foreign revenue. That the crisis situation in Niger Delta has largely contributed in casting Nigeria led democratic government of President Buhari to be described a nation with seeming economic uncertainty does not call for any expanded debate. In any case, the fact is that at the moment, any purposeful discourse on Nigeria cannot end without including the depressing reality associated with vandalization of oil facilities and insecurity caused by some disgruntled persons. These illegitimate actions have not only brought about so much devastation on the country’s economy but also introduced an unprecedented level of suffering to a majority of the Nigerian population. All these combined with issues of inappropriate and confusing government economic policies have resulted in the dwindling value of Nigeria’s currency, growing unemployment, complications in the management of the economy, delayed salaries and disappearing business outfits. Succinctly put, Nigeria’s pathetic situation has left over half of its population reeling in economic hardships. Conceivably, the current state of affairs might be the reason why some economic analysts strongly believe that without the stoppage of hostilities in the Niger Delta, Nigeria’s quest to overcome its recession may just be a dream too distant for actualization. Such analysts, even though recorded to have commended the tasking efforts of the seventy four year old President Buhari in addressing corrupting, remain sceptical that the global conversing by the Nigerian government for fresh investments will translate to meaningful gains without appropriately addressing the domestic problems of the Niger Delta disturbances which has projected Nigeria as unsafe for investment especially for oil related activities. Even so, one twisty contradiction herein is that these acts of violence perpetuated by persons largely termed Niger Delta militants are best described as self-inflicted injuries. This is particularly so because those that advance such ignoble activities are not immune to the economic hardship they cause the Nigerian people. Specifically, even the nine oil producing states that were hitherto classified as rich and distinctively different courtesy of billions of naira they earn as monthly allocation from oil derivation have witnessed diminished revenue which has made them incapable of paying salaries to their workers. On this Niger Delta predicament, the factual reality is that even though there is no amount of logic that would provide legitimate excuses for the violent acts and ill motivations of the Niger Delta militants, their claim of being the goose that lay the golden eggs yet neither feeds appropriately from it nor enjoys a proportionate share cannot be dismissed in any quality dialogue. Arguably, some persons may wish to use similar premises like Nigeria’s days of groundout pyramids to reach a set of varied troubling conclusions or raise skewed questions on the alleged preferential treatment of Niger Delta oil producing communities but this does not reflect the realities in oil production activities and the dangers it brings to the communities at a gain to the Federal Government. Consequently, the actuality remains that people from oil producing areas and those causing problems in the Niger Delta should be treated as mere trouble makers but pacified through rational responses and constructive dialogue. Indeed, the recent renewed violence in the Niger Delta region even though suspicious of skewed motive is a specific situation that calls for definite practical and sensible responses. This why I find the recent visit of Governor Okowa and Former President Jonathan to Gbaramatu Kingdom very relevant and necessary for an expansive discussion. Presently, the Niger Delta region though summed with the tag of complex unsettled issues is certainly not beyond remediation either by brute force or dialogue. However, on a sensible reasoning, dialogue remains a best option for peace if really Nigeria is desirous of continuing its oil production in the said region. In fact, it is also important to state that in any diverse society like Nigeria, at times unity may not suggest absolute uniformity because of existing varied interest groups and agitations. None the less, on some issues, national interest must take first place as there are lines that should not be crossed even by the most focused agitation; otherwise such may upturn the security and economic interests of a country. Certainly, this is what I think the President Muhammadu Buhari’s administration has tried to preach to the Niger Delta people. Unfortunately, the government’s approach of communication does not seem most appropriate especially for a people that have ears that seem blocked on the assumption of righteous anger. Again, on this dismal issue of Niger Delta restiveness, a lot of objective observers have posited that the Nigerian government is not blame free because contrary to its claim of doing so much for the Niger Delta, there exist a lot of contentious issues. Fundamentally, to the majority of Niger Delta people, the Nigerian Government is largely termed as another bullying masquerade that claims it is assisting on the one hand, yet on the other divide; it silently kills host communities through oil exploration activities without apposite corresponding development and remediation measures over issues of environmental degradation. Indeed, this remains a major disputation in government’s involvement in oil production activities in Niger Delta. On the other hand, granted that various efforts have been made by the Buhari’s administration to establish likely mechanisms it thinks would stop the violence in Niger Delta, however with due acknowledgement to the good efforts of the present Minister of State for Petroleum Resources, Dr Ibe Kachikwu, the reality is that such efforts are yet to provide any signal for long lasting peace. Consequently, the big question herein is, how best can the Nigerian government achieve stability in the Niger Delta region with neither force nor needless deaths, an issue which was hitherto almost perfectly tackled for almost a decade until the arrival of the President Buhari’s administration. Politely put, is it not possible to create a new line of diplomacy that can constructively persuade the militants to understand that there can never be any reasonable justification or righteousness for any group of persons to engage in extreme violence of murder of security personnel, innocent citizens and workers in guise of pursuit of self-aspirations? On this, the Nigerian Government seems to be missing the woods for the trees. In any case, the need to support peace with determined action is a must for both the people of Niger Delta and the Nigerian government. However, while the Niger Delta militants must get over the delusion that their inappropriate actions will provide credible solutions to their seeming neglect, on the converse, the Government should stop listening to only those that think vandalization of oil facilities by militants can be stopped by the power of military confrontation. With hindsight, it is easy to say this may just end up as an unnecessary war that the Nigerian military is woefully underprepared to win without causing thousands of civilian casualties and huge damage to the human rights of persons the government claims it is desirous to give better lives. Besides the many ambiguities that surround Niger Delta and the widely presumed attitude of Government’s neglect, the essential truth is that it is hopelessly naïve for any reasonable person to think that meaningful development will take place in Niger Delta region without peace. Amnesty in exchange for peace programme, in the present situation, what is essentially needed is not much squabble but a quick resolution of the differing issues for common good. Indeed, many polity watchers believe that the unique approach of peace employed by the late President Yar’Adua did not only clear the major obstacles of doubt but opened possibilities of trust on many issues of common interest between the government and the Niger Delta people. Realistically, any reasonable analyst on Niger Delta crisis will automatically understand that the exclusive peace initiative of the late President Yar’Adua was actually what guaranteed tranquillity in the Niger Delta region for almost a decade. Indeed, the Yar’adua’s peace initiative actually did show that talking frankly with the militants is not an admission of incompetence. Rather, it is wisdom which opens doors to strategic partnership for worthwhile deal for all parties in the Niger Delta crisis. Unfortunately, with Muhammadu Buhari as President and the militants back to the creeks to continue violence, there is no doubt that the late President Yar’adua’s peace initiative has been weakened to a state of near collapse. A regrettable incident and sad issue is that many people do not have the understanding that the entire blame should not be on the door steps of President Buhari but more on the greed of some different actors from the Niger Delta extract over socio political and economic personal gains. This is why the President must be clear eyed on what he reads about the Niger Delta crisis from some of trusted persons. For now, it may not be strange that even those politicians close to Mr President may be offering half-truths that give the an erroneous impression of the Niger Delta mess, thus sadly creating apprehension that may negatively motivate those that have sympathy for the militants not to embrace any patriotic zeal that will encourage an end to the conflict. This is for sure the extend that greed and politics have thrust Niger Delta. Interestingly, despite the above stated conjectures, all hope does not appear lost for genuine peace in Niger Delta. This is because after long months of chaos and imbroglio, it does seem that some persons from Niger Delta are beginning to think more creatively. The recent visit of Governor Okowa and former President Jonathan to Gbaramatu is clear testament that the quest for peace has gained steam. Indeed, any good follower of Niger Delta crisis ought to know the historical significance of Gbaramatu Kingdom. For avoidance of doubt, Gbaramatu is strategically located in the oil producing area of Delta State in the Niger Delta Region. It is a major Ijaw ethnic settlement that consists of many communities including Okerenkoko and Oporoza. Also, it is the home of one Chief Government Ekpemupolo a.k.a Tompolo, a well-known influential ex militant or militant depending on how one’s lenses are polarized. Certainly, given the new realities in the Niger Delta, the categorization of Tompolo will form sufficient discourse elsewhere but for now, let this peace go with the healthy assumption of Ex militant because the Nigerian constitution accords his the status of innocence until proven guilty. Never the less, it is on record that Tompolo was the force behind encouraging his co agitators to embrace the Amnesty of the late President Umaru Yar’Adua, unfortunately, that bond of peace between the Nigerian government and Tompolo faded as soon as the Buhari’s led Government charged him to court on multiple allegations of corruption and froze his bank accounts with billions of naira, he claimed he earned genuinely through contracts of pipeline monitoring and other related transactions related to sustaining peace in the Niger Delta. Ever since the government decent on Tompolo and issuance of arrest warrant, neither, Niger Delta, Gbaramatu, Tompolo, oil production nor Nigerian economy has known peace. Whatever this means, can be easily interpreted by the average mind but the truth is that Tompolo is still at the heart of Niger Delta matters and no amount of pretence or denial can diminish the fact of his influence over his people, an attribute the late President Yar’adua aptly utilized to attain peace in the Niger Delta. For ease of comprehension on Gbaramatu’s significance and Tompolo’s influence, in May 2009, according to Media reports, the Gbaramatu kingdom was attacked by a combined team of Army, Navy and Air force known as Joint Task Force (JTF). Military aircraft was used in attacking Tompolo’s infamous Camp 5 and his personal house at Oporoza. During the said military operation, it was alleged that innocent women and children were reportedly killed. Indeed, the military was said to have been provoked into taking the action because some of their personnel were allegedly attacked by the militants. Thereafter, at the instance of the late President Yar’Adua, his then Vice President, Goodluck Jonathan visited the Gbaramatu kingdom for successful peace talk with Tompolo and his fellow travelers. Definitely, the 2009 visit to Gbaramatu was highly instrumental to ending Niger Delta violence under the late President Umaru Yar’Adua; an event that will be too difficult to discard in the documentation of the history of Niger Delta. Specifically, the recent joint visit of Governor Okowa and former President Goodluck Jonathan to Gbaramatu in search of peace signals a personal commitment of these leaders that are indigenes of Niger Delta. That these men have spoken openly on an issue of national concern implicitly acknowledging that peace in the Niger Delta is a necessity, deserves commendation. The primacy of the visit by the duo of Governor Okowa and former President Goodluck Jonathan to Gbaramatu is that it has the potential of accomplishing success like the 2009 visit to Gbaramatu by former Delta State Governor, Dr Emmanuel Uduaghan and the same Goodluck Jonathan. While it is unrealistic to assume that the mere presence of Okowa and Goodluck Jonathan will magically bring about cessation of violence in Niger Delta without necessary corresponding actions by major parties in the crisis, nevertheless, the simple fact herein is that what Governor Okowa has resurrected at Gbaramatu will provide opportunity for some behind-the-scenes work that is certain to offer a more holistic approach to resolving the Niger Delta crisis. Such a vital peace initiative should not be allowed to crash on the basis of Government’s usual attitude of Talk only, No action, NATO or swallowed by unnecessary political cynicism, and bitterness. Consequently, now that Governor Okowa has provided a decent chance for what appears to be a short but effective road to peace, this diplomacy should not be thrown to the dustbin of history. The government of President Buhari must take on this positive momentum because if genuine actions for peace are swiftly pursued including quashing cases in court against some militants like Tompolo, then Yar’adua’s success on quelling militancy in Niger Delta may repeat itself. Certainly, there would be deep misgivings about the wisdom of this recommendation but the naked fact and unpretentious ugly reality is that Tompolo and company are significant interest group in this Niger Delta issue. Any denial of this should best be regarded as an assault to the sensibilities of any credible analyst. Be that as it may, the fact is that with present circumstances in Niger Delta, the capturing of Tompolo by the gallant men of Nigeria’s military on the basis of suspicion for alleged connection with militancy may just take a little time but will that ever suggest lasting peace in Niger Delta? Even the pursuit of seeming justice for the incarceration of Tompolo on issues related to alleged corruption is very unwise especially given that the entire momentary value in question is less than what is lost by the Nigerian government to violence in just a day in the Niger Delta crisis. Without quality reason and diplomacy, such actions of government may introduce a fresh set of complications. Amnesty, Rehabilitation and Reintegration Initiative of President Buhari, then failure of these new militants to adhere to peace will be a self-inflicted tragedy that would not only ruin them but will make them miss a last viable opportunity to access a likely new form of Amnesty which the focused Okowa’s initiative might negotiate for them. All said, Governor Okowa in his capacity as the Leader of an area that accounts for about sixty percent of this new militancy must further his peace initiative to actually demonstrate that he is both good at talking peace and walking the walk. On the other side, both the government and militants must see this Governor Okowa’s diplomacy as the best hope for the salvation of the Niger Delta and Nigeria’s economic concerns, thus encourage and embrace it. Dr Ephraim Okwuosa, a concerned citizen from Niger Delta and Co-ordinator, Anti-Corruption Advocates, writes from Area 11, Garki, Abuja. Everybody suddenly seems to have an opinion about how President Buhari should handle the Niger Delta crisis. However, Iet me quickly state that I have never seen a write up so balanced, unbiased and truthful on Niger Delta crisis. Governor Ifeanyi Okowa should sustain this peace effort. Okowa’s initiative is very focused and splendid as described by this writer. The involvement of former president Goodluck Jonathan is perfect step for peace in the Niger Delta. GEJ has done it before and he can do it again . Thanks to Gov Okowa for being scrupulously honest with his brothers in the Niger Delta that violence will not provide solution to their quest for development. We need more voices. Okowa’s initiative is very focused and splendid as described by this writer. The involvement of former president Goodluck Jonathan is perfect step for peace in the Niger Delta. GEJ has done it before and he can do it again.